Hostal Iznajar Barcelona offers 24-hour reception, free luggage store and free safe. Centrally located, the guest house is 200 metres from Ramblas and 5 minutes’ walk from Plaza Catalunya. Located in the city centre, the property is 5 minutes’ walk from MACBA Barcelona Museum of Contemporary Art and from Boqueria Market. Regular airport buses leave from a bus stop located 800 metres away. Rate: € 49.83 ... € 128.22; select dates below to get current rates. Rate: € 56.11 ... € 80.70; select dates below to get current rates. These air-conditioned rooms boast a flat-screen TV, free WiFi, a safe, a kettle and a welcome water. 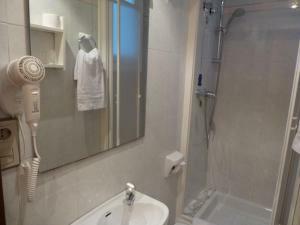 Rooms come with a private bathroom with hairdryer and free toiletries. This bathroom is located outside the room. Rate: € 44.00 ... € 139.00; select dates below to get current rates.